Smaller, lighter, easier to handle... designed to meet the needs of law enforcement. 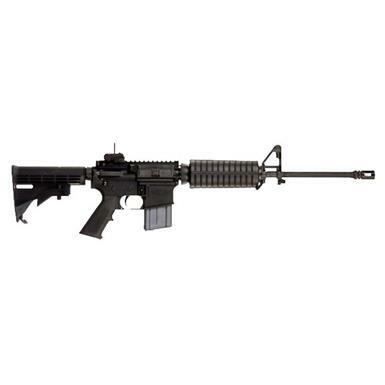 Offering the best of both military and civilian design, the Colt AR15-A4 Lightweight LE Carbine is a hybrid of Colt's Government Carbine model AR6520 and Colt's Flagship M4 Carbine model LE6920. Weighing in at just 6.12 lbs., the AR15-A4 Lightweight utilizes a unique direct gas operating system that eliminates the conventional operating rod, resulting in fewer and lighter components. That means less weight, and less fatigue in the field. Plus, field stripping is easy and requires no special tools. In addition, straight-line construction disperses recoil straight back to the shoulder, increasing handling capabilities, especially during repeated fire. A smartly designed cartridge case deflector allows easy operation in both right and left handed shooting positions for increased tactical applications. The Colt AR15-A4 Lightweight comes standard with optics rail and flip-up, military style rear sight that allows for maximum peripheral vision, giving the shooter the most unobscured view of the target. Barrel twist: 1 x 7"
Colt AR15-A4 Lightweight LE Carbine, Semi-Automatic, 5.56x45mm NATO, 16.10 Barrel, 20+1 Rounds is rated 5.0 out of 5 by 1. Rated 5 out of 5 by CTexas from Excellent! Exactly what I expected from Colt. Don't let the pencil barrel deter you, this is the best Colt is offering right now in my opinion. This gun is very well made, accurate and dependable.